In an upcoming report ‘Animal Drug Compounding Market: Global Industry Analysis and Forecast, 2016–2024’, Persistence Market Research has thoroughly analyzed the global animal drug compounding market. The animal drug compounding market report takes the help of key metrics such as incremental dollar opportunity, absolute dollar opportunity, CAGR, and Y-o-Y growth to deliver a truly comprehensive picture for all major stakeholders in the global animal drug compounding market. The global animal drug compounding market report begins with a succinct executive summary. This section provides a market overview with the market value in terms of U.S dollars, the CAGR, and the most important segment and geographic region of the global animal drug compounding market. The summary also provides an overall approach that could be adopted, along with the geographies to be targeted with an appropriate strategy to truly be successful in the global animal drug compounding market. The next section of the animal drug compounding market report moves to the definition and taxonomy. Some readers may not be aware of what the animal drug compounding market is or they may want some clarification. They can refer to the animal drug compounding market definition and taxonomy to understand the global animal drug compounding market at the grassroots level. In the market analysis scenario section, the animal drug compounding market size and forecast for the year 2016 and the year 2024 has been provided for all three likelihoods – a conservative scenario, likely scenario and most optimistic scenario. The Y-o-Y growth and absolute dollar opportunity help give a complete picture of the animal drug compounding market. The market dynamics section can be immensely helpful for both current and potential stakeholders in the global animal drug compounding market. It begins with the macro-economic factors that have an impact on the animal drug compounding market, the drivers from both the supply and demand side, the restraints and the opportunities that are available to tap. The relevance and impact of certain forecast factors on the animal drug compounding market have been highlighted. Regulatory bodies prescribe certain rules and guidelines that have to be enforced in the animal drug compounding market. The guidelines prescribed by nations as diverse as Australia, Ireland, Denmark, Canada and the U.S. have been mentioned in the animal drug compounding market report. In the next section, a market analysis on the basis of product type, animal type and formulation has been focused on. An introduction to each segment, the Basis Points Share, Y-o-Y growth projections and the market value forecast for each segment can be immensely beneficial to understand the nuances of the global animal drug compounding market. Some of the prominent trends and market attractiveness for each segment can be invaluable for stakeholders who may wish to only target one particular, lucrative segment of the animal drug compounding market. The global animal drug compounding market has been divided into five key geographic regions for the purpose of this study. Each region has been provided its own dedicated section where the report touches upon the regional BPS, Y-o-Y growth projections and the market value forecast on the basis of product type, animal type and formulation. The largest and most prominent countries in each region have been separately highlighted as well and estimates of their value in the year 2024 are given. A few regional trends, the drivers and restraints and their impact on that particular region complete this vital section of the animal drug compounding market report. It is highly unlikely to find any market that is completely devoid of competition and where a single company has a monopoly in today’s brutally competitive, cut-throat world. Before entering the animal drug compounding market, it is highly recommended to any potential stakeholder to do a thorough competition analysis. The competition landscape section has been prepared to serve this very objective. It profiles more than five renowned players actively involved in the global animal drug compounding market. The company details, a brief yet succinct description, the product offerings, a SWOT analysis and an overview of the strategy adopted by the organization to thrive in the global animal drug compounding market have been studied. The industry classification code has also been provided for a few companies. The research methodology adopted by Persistence Market Research is a truly world-class, award-winning one that can be considered one of the best in the industry. The analysts conduct exhaustive primary and secondary research at the outset. A key market player list that consists of every part of the value chain is developed and a questionnaire is prepared to extract all the necessary information with respect to the animal drug compounding market. After the data has been gathered, it is thoroughly validated using the triangulation method where primary and secondary data is combined with the expert analysis of Persistence Market Research analysts. The final data is then scrutinized with the help of advanced tools to glean all possible quantitative and qualitative insights into the global animal drug compounding market. Animal drug shortages are becoming more common and this is unfortunately predicted to worsen in the years ahead, as per official reports published by veterinarians. This shortage encourages the use of widely available compounded drugs to treat a number of animal diseases. A few critical animal drug shortages highlighted by the U.S. FDA are Flunixine Injectable, 35% Perox-Aid, and Epinephrine. To make medical therapy suitable for animal requirements, compounded drugs with the desired active ingredients are unavailable. For e.g., no FDA approved drug for treating megacolon in cats is currently available in the animal drug compounding market. The only safe and effective therapy to treat chronic cat constipation was removed from the U.S. nearly two decades ago. That is why compounding drugs are the only option for veterinarians to treat animals that need pro-kinetic drug therapy. The most common cause of neurological disorders in cats and dogs is an inflammation of the central nervous system. Seizures, abnormal limb coordination, blindness and behavioral changes are typical abnormalities seen in cats and dogs afflicted with inflammatory central nervous system (CNS) diseases. As per the International Journal of Pharmaceutical Compounding, CNS drugs were dispensed in almost 2/5th of the total veterinary prescriptions. By the end of 2016, the CNS Agents segment accounted for 37% revenue share of the global animal drug compounding market and it is anticipated to gain 30.4 BPS in its market share by 2024 over 2016. The CNS Agents product type segment is expected to create absolute dollar opportunity of US$ 16 Mn in 2017 over 2016. By the end of the forecast period, the CNS Agents segment is expected to exceed half a billion U.S. dollars in terms of value, registering a CAGR of 6.4% for the period 2016-2024. Revenue from the CNS Agents product type segment is estimated to increase 1.6 times by the end of 2024 as compared to the beginning of the study period. The most popular pets currently undergoing treatment for various CNS inflammations are cats and dogs. By the end of 2016, North America alone accounted for nearly 70% revenue share in the global animal drug compounding market and it is poised to gain 376.6 basis points over the course of the next eight years. This can largely be attributed to an eager adoption of pets in the region with the U.S having the bulk of the companion animals on the continent. The CNS Agents product type segment held a lion’s share of the North America animal drug compounding market in revenue terms in 2015 and this trend is predicted to continue for the rest of the forecast period, with the segment recording a market attractiveness index of 1.9. CNS drugs are being increasingly used in treating both myelitis and encephalitis in animals and this should boost the North America animal drug compounding market in the medium term. 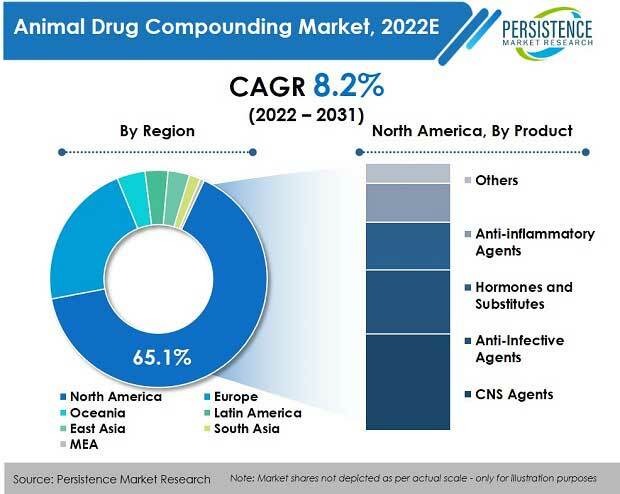 From a market value of just under US$ 220 Mn in 2016, the CNS Agents segment by product type is anticipated to rise to more than US$ 380 Mn by the end of 2024 in the North America animal drug compounding market, registering a value CAGR of 7.1%.